Overheating Germany economy causing heated Eurozone clashes? The European economy has been doing fairly well in the past period. Economic growth is exceeding the rate of potential and will likely do so for another while. This will drive down jobless rates. The latter would obviously be a welcome development in most Eurozone members. 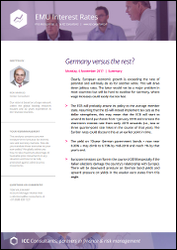 However, the German economy risks reaching a state of overheating, where inflation could easily rise too fast. Germany vs Italy – the defining Eurozone battle? The above is one of the reasons why Eurozone tensions can flare in the course of 2018: Germany could clash with the so-called weaker states in the currency union. On this note, the upcoming Italian elections could prove to be a mood changer, with former PM Berlusconi and the populist party of comedian-turned-politician Beppe Grillo leading the polls. This points towards upward pressure on the spread between German yields and yields in the weaker euro states. However, economic fundamentals and the ECB’s gradual tightening will probably first push the yield on 10-year German government bonds – now near 0.35% – to 0.75% by mid-2018 and to 1% by that year's end.